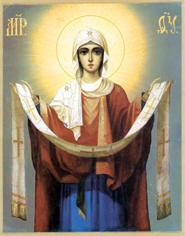 The Feast of the Protection commemorates the appearance of the most holy Mother of God in the Church of Blachernae in Constantinople in the early sixth century, as recorded in the life of Saint Andrew the Fool for Christ's sake. While the multitudes of the faithful were gathered in church, Epiphanius, the friend of Saint Andrew, through the Saint's prayers, beheld the Virgin Mary above the faithful and spreading out her veil over them, signifying her unceasing protection of all Christians. Because of this we keep a yearly feast of gratitude, imploring our Lady never to cease sheltering us in her mighty prayers. The Social Shelter project started in 2000 A.D. as an initiative of the "Precupetii Vechi" parish and is located on the grounds of the "All Saints" Church,92, Toamnei Street, sector 2, Bucharest. We owe our special thanks to all our partners, sponsors and donors for their loving support, may Good God help you all and all our prayers may join you in Christ (see DONORS page for the name list). For almost fifty years of communist regime the Romanian Orthodox Church was not allowed by the authorities to do charity work. The events of 1989 changed completely the situation in Romania and the Orthodox Church had again the freedom to play an important role in the social life of the people. Under the guidance and with the blessings of His Beatitude Teoctist, the Patriarch of the Romanian Orthodox Church, important steps were taken by both the clergy and the believers in order to meet these new challenges. Starting to find its new role in society and its potential for mission in Bucharest is very important for the spiritual life of the Orthodox Church because it fulfils the expectations of the people in need who have great confidence in the Orthodox Church, trusting that each sufferer as a representative of Jesus Christ will receive help. In accordance with the official statistics the population in Bucharest is 2.8 million people, un - official the number of population is far higher the estimates are about 4 million . The official statistics estimate the number of old people in Bucharest being 550,000. 70% from these are poor, homeless or ill .
Generally the old people are in a very bad situation, they are especially disadvantaged because under the legal conditions of the communist regime they couldn't provide for their old age when they were young and now they are obliged to live only on a state pension. This pension is very small (average 30-40 EURO/month) and covers with difficulty only the basic needs of a human being. Unfortunately there are a lot of old people who try to survive even on a smaller income. Romania is a poor country and the social services can't cope with the great needs of all the categories of people, young and old who are in difficulty. These people need desperately the support of the community because the central as well as the local authorities do not have actually the required means to solve alone the problem. Believing in Christian unity most people think that the Church is the best place where they can help each other and therefore they support and are confident in the charity projects developed under the authority of the Church. The Social Shelter "The Protection of the Mother of God" initiated by the "Precupetii Vechi" parish is one of these projects. The project has the support of the Romanian Orthodox Church as it is shown in the letter of the Metropolitan Diocese of Muntenia and Dobrogea - Archdiocese of Bucharest, letter which was signed by Bishop Varsanufie Prahoveanul who coordinates the social - philanthropic activities in our archdiocese. Your prayerful, moral and if possible financial support will be highly appreciated. As a good example of Christian unity and help of Christians of good will we have to mention and appreciate what has been already done by the Anglicans in Romania through the Church of Resurrection in terms of spiritual, financial and prayerful support. The Anglican Chaplain, Rev. James Ramsay helped us to develop this project, brought us several times aid in kind which was distributed to the old needy people and we prayed together to be able to do more for all those who suffer. Rev. James Ramsay's visits to our church, as well as our visits to the Church of Resurrection in Bucharest were good opportunities to know more about the spiritual life of the congregations, strengthening the ecumenical relations of our Churches.